Halophytes constitute an indispensable part of seawater farming systems implemented in coastal areas of desert lands where they do not compete with good quality land and water resources. Salicornia bigelovii is considered one of the most promising halophytic species that will grow in a biosaline context. However, suitable germplasm needs to be identified, domesticated and improved in order to achieve high enough yields to compete economically to conventional crops. In the current study, eleven S. bigelovii Torr. populations were evaluated for 22 growth parameters and irrigated with full-strength seawater (SW≈55 dS/m).The study assessed the adaptability of such plant material under the hot and dry climatic conditions that prevail in the Arabian Peninsula. High variation was observed among S. bigelovii populations for most of the characteristics under study. 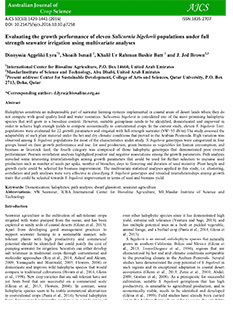 S. bigelovii genotypes were categorized in four groups based on their growth performance and use: for seed production, green biomass as vegetables for human consumption, and biomass as livestock feed; the fourth category was comprised of those halophytic genotypes that demonstrated poor overall performance. Pearson correlation analysis highlighted positive and negative associations among the growth parameters. Path analysis unveiled some interesting interrelationships among growth parameters that could be used for further selection to increase seed production such as number of seeds per spike, number of branches, days to flowering and duration of seed maturity. Plant height and growth cycle could be selected for biomass improvement. The multivariate statistical analyses applied in this study, i.e. clustering, correlation and path analyses were very effective in classifying S. bigelovii genotypes and revealed interrelationships among growth traits that could be selected towards S. bigelovii improvement in terms of seed and biomass yield.